Science 18 February 2005: 1091-1094. The discovery of a new member of the rabbit family, Gomphos elkema, in Mongolia pushes back the oldest known rabbit from 35 to 55 million years. 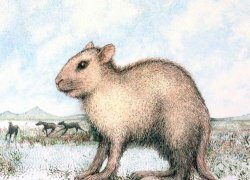 It had some very rabbit-like features such as a long hind foot, but it also had a long tail and squirrel-like teeth. Gomphos supports the hypothesis that rabbits are not closely related to the zalambdalestid mammals that lived during the Cretaceous with the dinosaurs. This suggests that placental mammals evolved after the extinction of the dinosaurs 65 million years ago.